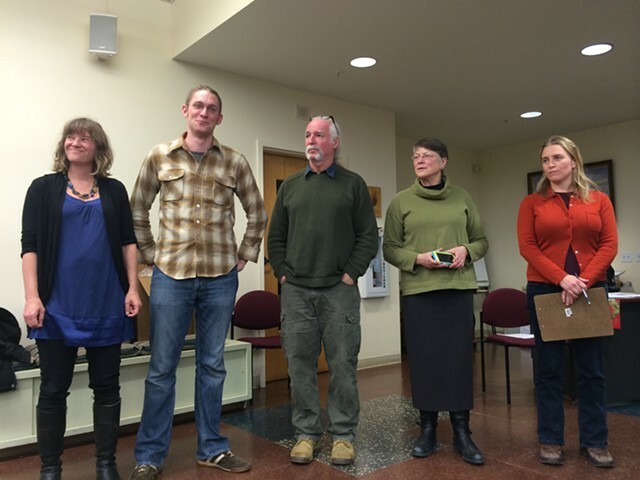 Progressive candidates Selene Colburn, Max Tracy, Jane Knodell and Sara Giannoni surround mayoral candidate Steve Goodkind at a January nominating caucus. Democratic Mayor Miro Weinberger may have trounced Progressive opponent Steve Goodkind in Tuesday's election, but Democrats lost their plurality on the Burlington City Council. Progressive-affiliated candidates won six of the council's 12 seats, while Democrat-affilliated candidates won five and Republicans one. "It's really a huge victory," Vermont Progressive Party chairwoman Emma Mulvaney-Stanak told party members Tuesday night at Magnolia Bistro. A recent redistricting process reduced the number of council seats from 14 to 12 and forced all incumbents to seek reelection. The new map includes eight traditional wards and four new "districts," which are each made up of two wards. In the outgoing council, Democrats held seven of 14 seats, while Progressives had five and Republicans and independents each had one. Democrat Joan Shannon served as council president. But on Tuesday, four Progressives and two Prog-affiliated independents prevailed. Assuming that Republican Kurt Wright votes with them, as he often does on organizational matters, they should be able to take the council presidency. At Magnolia Bistro, several attendees shouted "Council president!" when veteran Progressive Councilor Jane Knodell prepared to speak to the crowd. "Maybe, maybe," she said. "I think this is a good night for us... We're going to have a strong and independent city council." Said Progressive Councilor Max Tracy, "Mayor Weinberger won tonight, but he did not win in terms of the city council. We were up against a machine, really." At the Democratic gathering at Nectar's, Shannon acknowledged the changed makeup of the council. "The mayor comes out of this with a very clear mandate and I think councilors of whatever political party will want to work with him," she said. "It's not a rubber stamp but it never was." "It's going to be a different three years," added Democratic Councilor Chip Mason. "This will impact the mayor's agenda... It will not be business as usual." Progressives won all three seats in the Old North End. Two newcomers, Progressive Sara Giannoni and Democrat Sarah McCall, vied for an open seat in Ward 3. Giannoni came out 67 votes ahead of McCall — or 53.6 percent to 46 percent. Next door, Tracy won Ward 2 without any opposition. Knodell easily defeated independent Ron Ruloff 79.8 percent to 18.6 percent in the Central District, which includes Wards 2 and 3. Up the hill, a Progressive and two Prog-leaning independents prevailed. In Ward 1, longtime independent Sharon Bushor won without opposition. In the newly created Ward 8, which is centered around the University of Vermont campus, recent graduate Adam Roof, an independent, beat undergraduate Brock Gibian, a Democrat, 62.2 percent to 37.8 percent. Incumbent Prog Selene Colburn defeated another UVM student, Carmen Scoles, 60.1 percent to 39.7 percent in the East District, which includes Wards 1 and 8. In the New North End, Republican Wright handily defeated Democratic challenger Jim Holway in Ward 4, 63.8 percent to 35.9 percent. 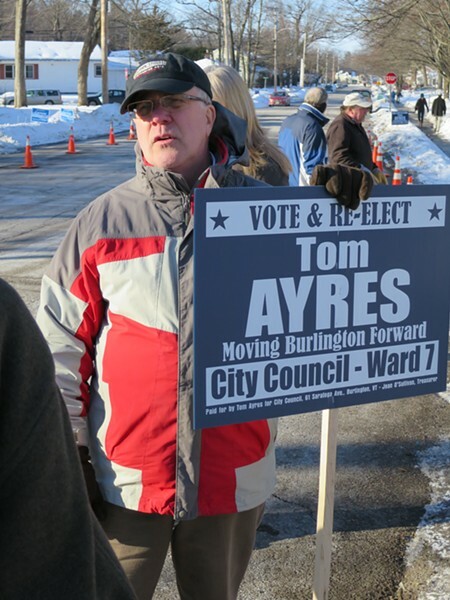 Democratic incumbent Tom Ayres, meanwhile, beat back Republican Michael Ly by just 30 votes in Ward 7. The margin was 51 percent to 48.8 percent. 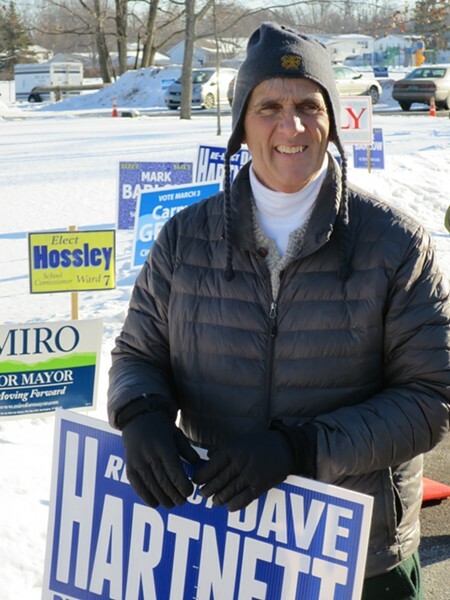 In the North District, which covers Wards 4 and 7, incumbent Dave Hartnett beat back a challenge from Democratic former councilor Carmen George 68.9 percent to 36 percent. Hartnett, a lifelong Democrat, was defeated in his own party's caucus in January, but he went on to earn Weinberger's endorsement. He has pledged to caucus with Democrats. Democrats kept all three seats on the south side of town. In Ward 5, incumbent Dem Chip Mason bested Progressive challenger Mike Fife 60 percent to 39.7 percent. In Ward 6, incumbent Democrat Karen Paul won without opposition. Shannon, the Democratic council president, took the South District, which includes Wards 5 and 6, without opposition.